Compare TV on the left with the others. Left is still analog, while right is digital:) GMA is still analog, ABS & TV-5 is now digital. Why choose a TV that is ISDB-T ready? Aside from the fact that ISDB-T offers fantastic HD image and sound quality, the most relevant features of ISDB-T go beyond entertainment. The ISDB feature allows your TV to receive quicker emergency warning notification and on-demand information through its Emergency Warning Broadcast System (EWBS) and Broadcast Mark-up Language (BML). This feature allows the TV to receive real-time alerts from reliable government agencies (such as PAGASA or Phivolcs) regarding natural disasters. Meaning, if there's a typhoon or earthquake, even if you're watching a show or your TV is off (but plugged) it will flash an emergency message or warning. Cool right? That's what we need especially in this typhoon-ridden country. Thank you Japan for this life-saving technology! What is SHARP's ISDB ready TV? That would be the Sharp Digital TV lineup LE-360D3 Series!!! While there are other ISDB-T-ready Digital TVs now available in the Philippines, only SHARP offers units that are equipped to receive EWBS and BML. So if you're planning to buy a new TV or upgrade your existing, choose one that is ISDB ready. And why look at other brands pa? Choose the one that is always on the forefront of innovation-- SHARP! :) The LE360D3 is available in 70”, 60”, 40”, and 32”, while the new LE570X comes in 55” and 50” sizes. What if I already have a digital TV and I want to upgrade to ISDB? Upgrading to Sharp’s Digital TV means you can now enjoy all of the benefits of ISDB-T. For people who are not yet ready to make the complete shift, a Sharp Set-Top Box can be plugged into your non-ISDB-T TV so you can also enjoy the full benefits of ISDB-T. Now I know what those black square boxes are for! It is Sharp Corporation Japan's wide range of LCD televisions and component screens which includes small, portable models (e.g. the 13" B series) up to large home-theater screens (e.g. 65" high-definition widescreen models), as well as component screens for portable devices including mobile phones. The company’s AQUOS LCD panel technology improves every year. 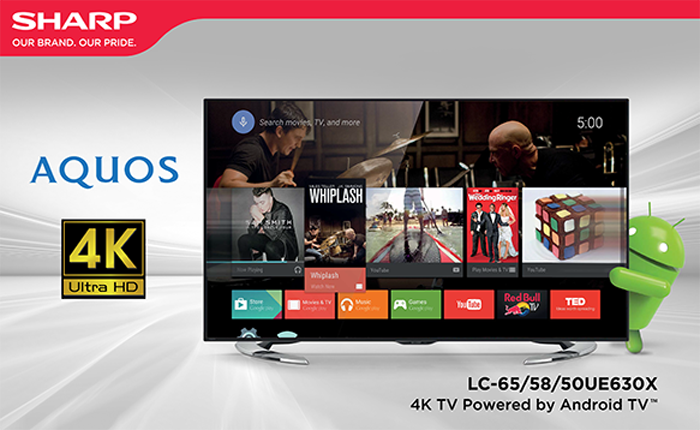 One of their newest product introduced to us that day is the Sharp 4K TV Powered by Android TV™ (UE630X). What makes it special? Why choose this TV over other brands and other styles? 1. Android Powered &^ Android TV - enjoy your favorite contents easily through Google's variety of apps. 2. Google Certified - allows users to search thousands and thousands of movies, TV shows, and YouTube™ videos in the easiest and most convenient manner possible. 3. Voice Control - There’s no need to sift through hours and hours of content — simply push a button, tell the TV what you want through the voice control on your remote, and enjoy! 4. Access Google Play Store - Users can easily access all their favorite Android apps and games on their television from the Google Play™ Store. Unlike Android TVs, this new Sharp 4K TV comes with its own gamepad for better controls. You could buy a console to use for gaming. 5. 4K Ultra HD resolution - enjoy larger-than-life detail with resolution 4x clearer than Full HD. The UE630X has a built-in 4K Master Engine Pro, Sharp’s unique processing engine that up-converts any Full HD content for a hyper-realistic viewing experience. 6. Rich Color Feature - wider color representation through innovative luminescent materials used for this model’s LED backlight. 7. Built-in Google Cast™- this technology lets you cast your favorite entertainment and apps from your phone, tablet or laptop right to your TV or speakers. The apps, videos, and pictures stored in your Android or iOS devices can be streamed to this TV’s bigger, brighter screen for sharing with the whole family. * The UE630X is available in 50”, 58”, and 65” models. You could view Youtube videos, play games, search for TV series & movies! Photo from our speaker's mobile phone which he took that day! You could also play videos from your mobile phone, usb, hardrive. How much is the UE630X Android TV? We also tested Sharp's Active Multimedia System or SAMM! It is all-in-one entertainment system made to provide total enjoyment and fun for you and your family. It is a TV with a videoke console! The TV is detachable. You could use it to play your favorite music or movies, view photos or sing your favorite songs! This karaoke machine has 1,200 licensed songs programmed in it. You have the option to purchase an exclusive SAMM USB offering that has 1,800 more videoke songs. Yes please!